Negoce Auroville Greens in Behala Chowrasta, Kolkata South by Negoce Capital is a residential project. The size of the Apartment ranges in between 548.0 sq.ft. and 932.0 sq.ft. Negoce Auroville Greens price ranges from 18.45 Lacs to 27.96 Lacs. The project is spread over a total area of 0.05 acres of land. Negoce Auroville Greens has a total of 1 towers. The construction is of 3 floors. 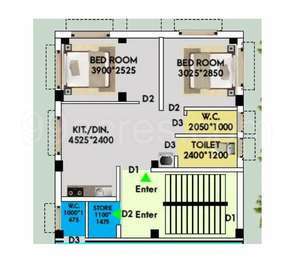 An accommodation of 7 units has been provided. Negoce Auroville Greens brochure is also available for easy reference. Where is Negoce Auroville Greens located? 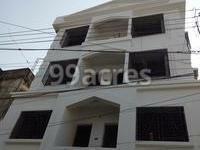 Behala Chowrasta, a prime residential locality for house seekers in Kolkata South. What size of flats are available in Negoce Auroville Greens? The apartment sizes in the project vary from 548.0 sqft to 932.0 sqft. What is total area of 2 bhk in Negoce Auroville Greens? 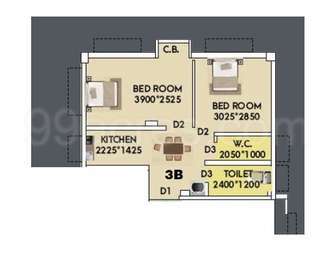 The area of 2BHK units in the project varies from 548.0 sqft to 932.0 sqft. How much is the total size of Negoce Auroville Greens?The project is spread over an area of 0.05 Acres. What is total price of 2 bhk in Negoce Auroville Greens? The price of 2 BHK units in the project ranges from Rs. 1589200 to Rs. 2702800. What is the price of apartments in Negoce Auroville Greens? The units available in the project are priced at Rs. 1589200 to Rs. 2702800. Negoce Capital is a name synonymous with integrity and trust. Established in 2006, the company has carved a niche for itself in the real estate industry and its evolution has been dotted with trail-blazing success. Committed to providing the best personalized real estate services to its customers, the company has several prestigious projects under its belt. It is backed by a team of dedicated and talented professionals who are passionate about their work and customers.